Recently I’ve been collecting Star Wars figures again. When I was a kid I couldn’t afford them. Now I can so I’ve been buying them and keeping them in their box for a later date when they’ll be worth a lot of money. My son thinks I’m hilarious, but he’s only 1. It’s not a very secure industry. I’ve spoken to a couple of people recently who had a successful TV show and then found themselves absolutely skint and struggling to find a job. I spend days with writers’ block. It is a problem. I haven’t got a car or a house. I’ve got a wife, but I didn’t pay for her! I spend all my money on my glorious wife. She’s here with a knife at my throat! I don’t have much choice these days in how I have my hair. All the parts I get offered are character and comedy parts, and I probably wouldn’t get them if I had a different face. So I’m glad I have a comedy face. 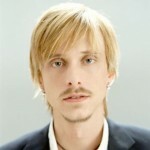 Mackenzie Crook's father, Michael Crook, worked for British Airways, and his mother, Sheila, was a hospital manager. He has two sisters. As a child he was put on a course of hormone therapy for three years due to a growth hormone deficiency. In the summers he spent time with his uncle at his tobacco farm in northern Zimbabwe, where he developed his love for painting.